Understanding how to bridge obstacles. Doka is firmly committed to building its lead in formwork-technology. This is the reason it continues developing measures to boost construction efficiency and putting them into practice systematically. Firstly in formwork systems, and secondly in the technical services to go with them. Doka formwork solutions always come as a package that delivers tangible benefits and added value to our customers. We have a client-orientated mindset and 'build bridges' to our customers' goals. As a pathbreaking formwork manufacturer, we take an all-encompassing view of the construction sequence. Formwork planning and formwork statics are just as much a part of our spectrum of services as are on-site assembly and subsequent formwork return. Only an end-to-end formwork concept will deliver the best results. The mere fact of dealing with just one partner for formwork ensures that the interfaces are well co-ordinated. We successfully accompany you all the way through your construction project. 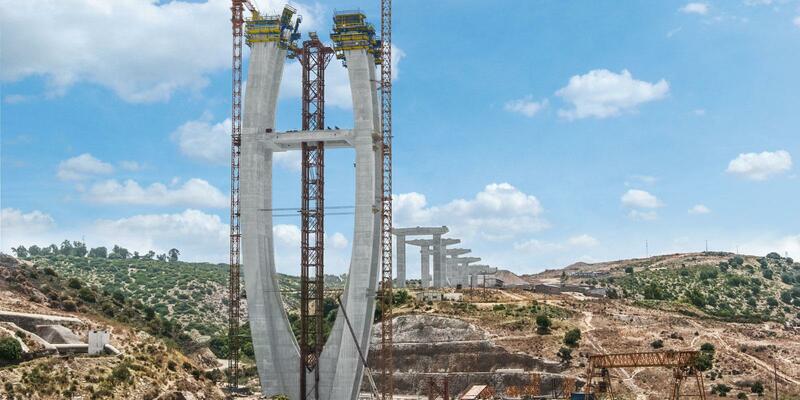 Doka's versatile automatic climbing formwork SKE100 and large area formwork Top 50 were used to erect the 200m high piers of the cable-stayed bridge across the Bouregreg River in Morocco. This bridge in Norway spanning 670m is expected to shorten the link between Loding and Bodo and is built using the cantilever forming traveller developed by DOKA. Since this cross-section comes with a very high concrete weight, it is necessary to shorten the lengths of the casting sections - not a problem for the DOKA traveller designed for flexible deployment. This bridge spanning more than 11 km will make it possible to cross the Orinoco River and its adjoining swamps and flood-plain by both road and rail. Two pylons for the third bridge across the Orinoco River in Venezuela are taking shape with automatic climbing technology from Doka. As part of the twin-carriageway upgrade to Austria's A2 S? ?d-Autobahn a second, 700 m long bridge superstructure had to be constructed alongside the existing P30 valley crossing at a height of around 70m. It was built as a steel-composite superstructure, meaning that once the steel superstructure was in place, the CIP concrete deck slab was cast with the aid of a Doka composite forming carriage. The Massman Traylor Alberici JV is currently building a new 457 metre long cable-stayed bridge across the Mississippi between St. Louis, Missouri and the Metro East region of Illinois. The bridge has two lanes in both directions, with room for expansion to three if increased traffic volumes require. The most important component of the project aimed at increasing the capacity of Belgrade's transport infrastructure is a new bridge across the Sava River. With its 200m pylon, this new cable-stayed bridge is set to become a defining landmark of the Serbian capital. To ensure that work on this complex structure is carried out smoothly, Doka is supplying many different formwork systems. In Mumbai, Hindustan Construction Co. Ltd. erected an 8-lane motorway bridge connecting Bandra and Worli across the sea. The centrepieces of this structure are its two pylons, each 128 m high and consisting of four legs. Owing to the complex fair-faced concrete requirements, large-area formwork Top 50 was used here in conjunction with a steel formwork. This 3100 m long 4-lane motorway bridge is being erected to link an offshore island to the mainland. With a pylon height of 320 m and a free span of 1104 m, this project breaks two world records at once. Doka's automatic climbing formwork SKE50 and SKE100 has been fielded to ensure that the pylon is completed in time. Our capabilities span far and wide. We focus on the formwork-engineering challenges right from the design phase. Even at this early stage, we start contributing our knowledge so that the works can be carried out swiftly, efficiently and economically. We bring much more to the table, still: a solution in form of the right formwork system. Piers decrease the width of the superstructure support centres between the abutments, thereby permitting a lower overall height. They mostly take the form of single or paired piers. On cable-stayed or suspension bridges, the central support takes the bridge loads, which are suspended from it. This is referred to as a pylon. They basically take the form of self-supporting pylon towers, A or H pylons or portal pylons. Our extensive planning expertise and high-performing crane-climbed and automatic climbing formwork systems can handle great variability in the design of piers and pylons, regardless of geometry, height and dimensioning. If the superstructure of a concrete bridge is not far above the ground, it can be constructed cost-effectively and efficiently using falsework. Falsework is an auxiliary construction used for holding building materials and systems in shape, particularly in the field of concrete bridge construction. On multispan bridges, the superstructure is mostly cast a section at a time using a single falsework construction. Cost-effective planning and on-time delivery of materials-optimised shoring scaffolds for transferring high loads from bridge superstructures safely and economically. The bridge sections are cast one after the other by a pair of cantilever forming travellers that work outward from a pier (pier head) and carry the formwork, rebar and the weight of the fresh concrete. In most cases, this takes place more or less symmetrically to either side of the pier. The casting sections are generally between 3 and 5 m long. Outstanding cost-efficiency and rapid equipment availability, made possible by Doka's rentable all-in-one system. Also, high certainty regarding planning and execution, thanks to thorough project support from Doka, taking in everything from detailed planning to co-ordination with the superstructure designer to on-site support by the Competence Center for Cantilever Construction. Put in simplified terms, the longitudinal steel girders of the bridge are connected to the CIP concrete deck slab by means of shear connector studs so as to obtain a shared (i.e. 'composite') load-bearing effect. Having the longitudinal bridge girders prefabricated at the plant will result in a significantly reduced construction period. The composite technique delivers low-cost, durable, low-maintenance bridge-deck solutions, the reason it is used for structures ranging from small overpasses to large viaducts. Cost-effective solutions for widely differing bridge geometries are achieved by using rentable, variable, all-in-one systems and the comprehensive project support provided by the Composite Bridge Competence Center. Bridge superstructures that are built using launching-girder equipment are usually constructed one span at a time on service girders that can be relocated along the longitudinal direction of the bridge, without mid-span support between the bridge piers. The launching-girder method is best used for multispan bridges with more than 7 spans, for bridging deep valleys, and where access is made difficult by obstacles such as nature reserves, lakes and rivers, or by the need to bridge existing traffic routes. Project-specific planning and pre-assembly of high-performing formwork systems enhanced by our long-standing collaboration with leading suppliers of launching-girder equipment mean smooth, efficient construction progress. Project-specific planning and pre-assembly of adjustable formwork systems for casting-yard construction, with practical formwork closing/opening logic for time- and cost-optimised workflows. The arched bridge is surely the most visually impressive constructional bridge design. Particularly when it comes to crossing deep ravines, arched bridges are the preferred design. The most common construction methods are cantilevering and conventional falsework. An alternative technique here is the lowering-arch or "swivel-in" construction method. Extensive planning services, and rentable formwork solutions that can be specifically tailored to the statics of each superstructure, for optimised load transfers and ensuring that the project progresses to plan. Working together closely makes it possible to decide on a solution for your complex bridge project. Your requirements are discussed with Doka experts as early as in the project development phase, influencing its success from an early stage. Tap into the know-how accumulated from numerous successfully executed bridge projects. Thank you for your interest - Bridges. Thank you very much for your interest - Bridges.